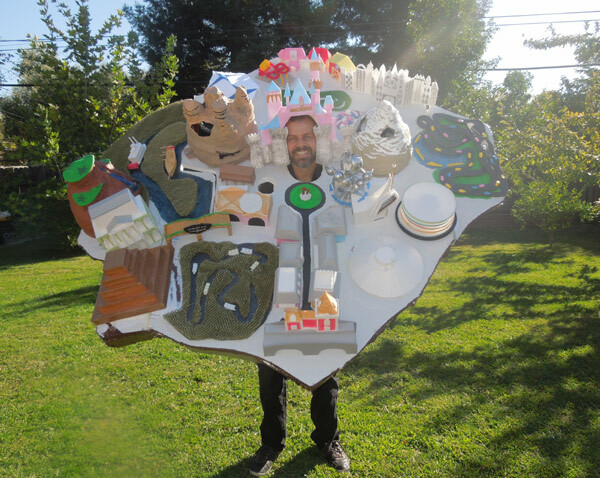 Known for creating clever and detailed Halloween costumes, we’ve been waiting weeks for Rob Cockerham of Cockeyed.com to finish his amazing costume for 2013 so we could feature it here. His handcrafted masterpiece for this year features his “favorite attractions from the happiest place on earth,” Disneyland. He used lots of foam, newspaper, and other craft supplies to build it and says, “Sleeping Beauty’s castle is on my head. I’ve got Walt Disney and Mickey right in front of my mouth, and a great look down Main Street USA. Behind my head are the teacups, King Arthur’s Carousel, Dumbo, the Storybook Boats, Small World and Toon Town.” Additional photos and full details on how he made it (and wears it) are available on his site. He’s hoping to win the costume contest at Thunder Valley Casino in Lincoln, California and we’re thinking he has a real good shot.